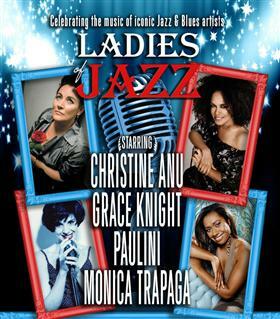 By popular demand, four of Australia’s most celebrated female artists Christine Anu, Grace Knight, Monica Trapaga and Paulini will be reuniting for the love of Jazz & Blues music and to pay homage to legendary Greats in a two hour show. Ladies Of Jazz will provide an explosive celebration of music from the 30’s, 40’s, through to now. Songs made famous by iconic singers like Dinah Washington, Etta James, Billie Holiday, Nina Simone, Nancy Wilson, Ella Fitzgerald, Peggy Lee and many more.